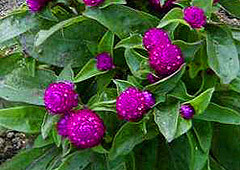 Compact and colorful, Gomphrena produces globular flowerheads that brighten the garden and are great for fresh-cut and dried floral arrangements. Excellent choice for dry, sunny locations. dried flowers - The floral heads make very good dried flowers, simply hang them upside down in a well-ventilated place, and you will have color to enjoy all winter. Propagate by seed - Start the plants from seed indoors 6 to 8 weeks before the last frost date, or scatter them where desired outside after frost danger has passed. Cover the seeds with a light layer of soil, as darkness aids germination. Water in very dry conditions. Look for dwarfs and different flower color variations. �Woodcreek Mixed�: flowers in shades of orange, red, magenta, pink and white on 1 �� tall plants. These plants are the best for dried and cut flower production. 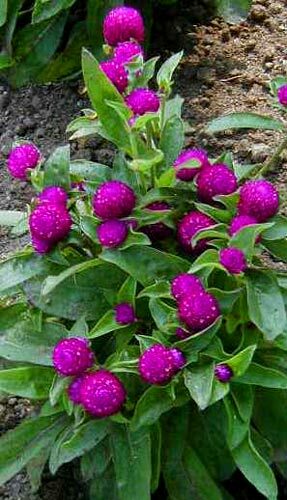 �Buddy� Series: dwarf (8� tall) plants are mounded and very compact. Very reliable in the border. Flowers in shades of purple and rose. �Full Series Mixed�: 1 � to 2� tall plants with flowers in shades of pink, red, purple, white, and orange.